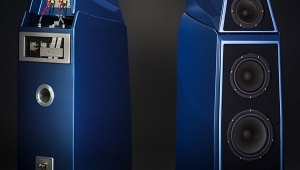 Until 1986, nearly all UK speaker companies shied away from competing head-on with the bigger US loudspeakers, but two models launched last year appear to take up the challenge: the KEF R107 and Celestion System 6000. 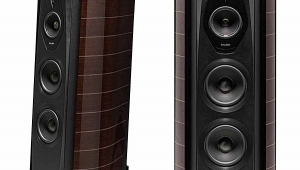 Roughly comparable in price in the USA, $3900 and $4930 (including SL600 "satellites") respectively, both are flagship designs intended to make a serious bid for the upper-middle sector of the audiophile market. Both are decently sized three-way systems using moving-coil drive-units. The similarities are extraordinary, though their appearance and operating principles could hardly be more divergent. 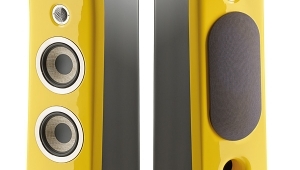 To cover the common ground first, both are floor-standing models employing tandem bass units with pulp-cone diaphragms operating over an electronically extended low-frequency range, crossing over at relatively low frequencies, 200 and 100Hz respectively, to the upper-frequency sub-enclosure. 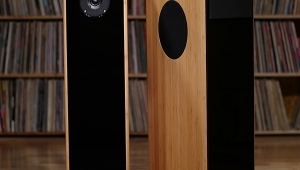 Acoustically speaking, the low-frequency cabinet structures are singularly rigid and nonresonant. 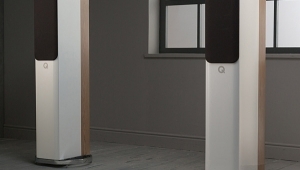 Both have mid and treble drivers fitted in compact, demountable sub-enclosures: 8-12 litre boxes with the tweeter positioned vertically above the mid driver. The latter measure 5 and 6.5 inches, with flared plastic-cone diaphragms. High-loss synthetic surround terminations are fitted; intrinsically, these units have an extended frequency range of better than 80Hz to 5kHz, which represents a span of some five octaves. The upper crossover of both designs is set in the 2-3kHz range, while the tweeters are small dome units, measuring 27mm and 32mm in nominal diameter. 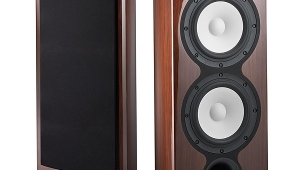 The mid/treble sub-enclosures are constructed in very different ways, yet with equal success in producing cabinets with very low intrinsic coloration. These smaller head enclosures endow both speakers with the equivalent cabinet width of a stand-mounted miniature, with the same high standard of stereo focus. Both speakers may be keyed into the floor by means of carpet-piercing floor spikes (not suitable for antique carpets or parquet flooring!) which give an absolute rigid stance, one highly conducive to sharp stereo focus, as well as a clean, dynamic bass. The correct operating height for the SL600 is when a seated listener can just see over the top of the enclosure. 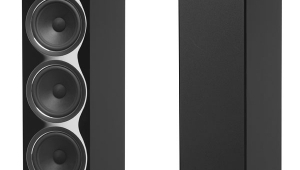 The System 6000 replicates that height, in addition to providing a massive nonresonant support for the '600, while at the same time giving a new measure of bass performance. Conceptually, the SL600 was designed to have a fast time signature, especially with regard to its remarkable enclosure, which was engineered for low energy storage. The introduction of this enclosure was a major step forward in reducing the box coloration restraining the performance of so many other systems. 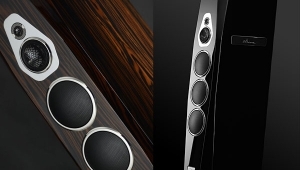 In continuation of this concept, System 6000 lacks any cabinet or enclosure for the bass. 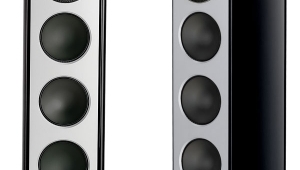 By omitting the enclosure, the bass section has been engineered to a standard compatible with the SL600 in terms of energy storage or, as in this case, the lack of it. Within the strangely shaped bass section are two 12" bass units, mounted "front-to-front" and spaced by an open air gap. There is no box or baffle as such, just the reinforced panels on which the drivers are actually mounted. 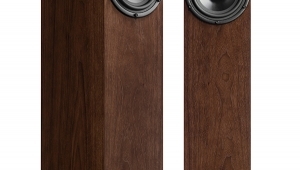 The woofers are long-throw, low-resonance units with high stiffness, flared, pulp-composition diaphragms. 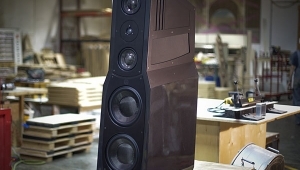 With the cones moving in the same acoustic phase, the 6000 bass section constitutes a bidirectional push-pull radiating element, or dipole, little different from an open panel loudspeaker. (The pair act as a virtual drive-unit located at a point midway between them.) A dipole has an output concentrated in the fore and aft directions, while the output at the sides falls to zero. This directional property is exploited in aerials to improve the signal recovery, and adding a second element makes the array performance still more directional, increasing the sensitivity or power gain in the desired axial directions. The second bass-driver, placed close behind the first in the 6000, constitutes just such a second element, resulting in a simple array equivalent to a two-element FM aerial. In addition, the excursion required for a given low-frequency sound level will be reduced, with the workload shared between two drivers. Celestion's designer Graham Bank has therefore produced a subwoofer which operates as a boxless, minimum-baffle area, double dipole with a bass output beamed in its operating frequency range (25-100Hz). Fundamental questions must be raised, however, concerning the relationship of a dipole to room loading. Extensive computer-modeled tests on rooms and positions indicate that directional bass will be an advantage since the bass beam or lobe may be directed toward the listener, thereby giving a much higher proportion of direct sound. Conventional box bass is omnidirectional, attaches itself to those local boundaries local to the speaker, and is then driven down the room, exciting a high proportion of the low-frequency standing wave modes. This leads to extensive unevenness in the response. A directional bass-dispersion pattern avoids the ceiling and sidewall reflections, thus reducing such room excitation. In low-mass electrostatic-diaphragm panel dipoles, the back-wave reflection dominates the acoustic impedance or reflected air load on the panel, destructively nulling the output over a range of bass frequencies. 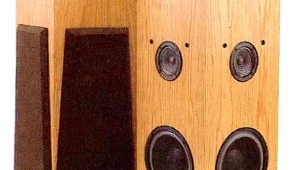 The Celestion woofers are high mass, however, and are thus indifferent to the back-wave returning from the rear wall; this eventually arrives delayed and partially diffused at the listening position. The intrinsic response of the enclosureless subwoofer is a gentle 6dB/octave rolloff below its turnover point. 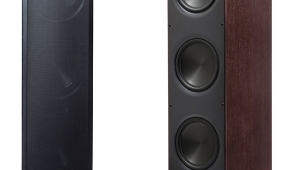 With simple first-order equalization and variable bass-unit angling with respect to the room, the optimum combination of balance and extension can thus be realized.